JOIN US AT THE CORNER OF BUSINESS AND COMMUNITY! 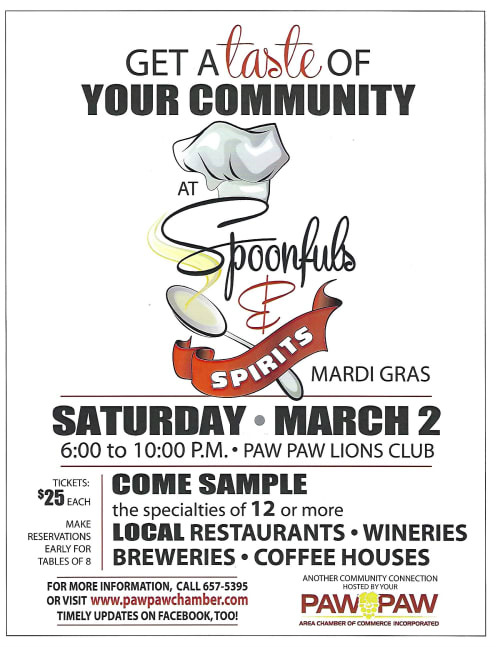 Spoonfuls & spirits will feature 12 of our local restaurants, offering their special appetizers, salads, entrees, and desserts, plus choice of selections of member wineries, breweries, and coffee houses. Community awards will be presented, the popular photo booth jail and all its associated antics will be back, and other get - acquainted activities will fill out the evening and make neighbors of us all. Sponsors will be visible and acknowledged throughout the event, and in promotions leading up the the big night. Don't miss out on the fun and unique opportunity to put the spotlight on your business! Partner with us as a sponsor! To be a sponsor your chamber membership must be current!